In response to the outpouring of latter day compassion for those impacted by the Haiti quake, past presidents Bill Clinton and George Bush led the calls for people to reach out generously – with money. “Don’t send tents and blankets, don’t send food and water, send money.” Did anyone stand back for a moment and consider the fact that it was the animation (the act of imparting life or spirit to that which is without the same) of money which created the indifference that created the tragic loss of life in Haiti? Did society consider that maybe, compassion of hands and heart, sweat and blood – while more “inefficient” – would more likely render permanent a connection between the people who have so little living so close to those with so much? Americans blankly looked at the headlines on Friday, January 29, 2010 and puzzled over the news that the American economy grew by much more than economists predicted. And, if they would have actually read the U.S. Commerce Department data, their puzzle would have deepened. Though the GDP grew by 5.7%, much of this “growth” was not actually impacting the average American. And, missing from the truth in the report was that the only sectors of alleged growth were those where the Federal Government was offering economic stimulus injections which artificially inflate the actual GDP. The consumer spending, decoupled from tax and incentives offered by the U.S. government, not only fell but probably was more accurately measured by the compression of inventory and decrease in imports. Since GDP has been a crude measure in the best of times and an utter failure in indicating economic future performance, why do we continue to measure that which does not explain or prognosticate? As politicians stand in faux incredulity lauding economic progress that none of the electorate can perceive, where is the call for metrics that convey meaning? Given that the most ubiquitous purchase made by American families is food and energy, why does the U.S. Commerce department continue to perpetuate the measurement of consumer price growth excluding food and energy? Oh, and by the way, if you read the fine print, the real news – ignored by ALL the media hype about the 5.7% growth in the final quarter was that Real GDP for the year of 2009 was -2.4%. The reason why we don’t feel better off is because we are not. We listened as the Tax-Collector-Evader-in-Chief testified in Congress that saving AIG was a decision made for the best interest of the American people. As our elected leaders grilled the Secretary, he stood his ground and, ironically, probably told most of the truth. However he was shielded from the whole truth by a Congress which is incapable of, or unwilling to, ask the right questions. How did the Treasury and Fed actions actually ameliorate the toxic behavior of AIG when all they did was cover the recklessness by moving it to other balance sheets? No pension is more secure, no bank more stable, and the U.S. taxpayer is worse off by their actions. In fact, one year later, the SAME toxins are still in the system – they just have cute names and the Fed and Treasury are shareholders and guarantors of what AIG once originated. In all the hype about the “main street” rage about bank bonuses, did anyone look at the fact that the bank profits in 2009 are Ponzi profits? If you look carefully, you find that the banking profits are being reported only where U.S. government equity interests (including a need for Treasury and Federal Reserve Balance Sheet profit reporting) are present. And where are people of conscience, patriotism, or any other broader sense of responsibility when, just last week, the Federal Reserve Board’s Federal Open Market Committee reinforced the likely criminal incompetence that aided the financial raiding of the U.S. economy by enshrining Moody’s Investor Service, Fitch, and S&P as the arbiters of economic risk? These Nationally Recognized Statistical Rating Organizations (NRSRO) are incapable of acting with independence due to the imposition of FOMC credit and collateral rating rules. In short, the very organizations which give them their anti-trust-flaunting capability of legal market collusion dictate the minimum capital and collateral conditions to prop up the illusion of financial stability. Given that NONE of these organizations provided any independence prior to the market collapse by offering true ratings of risk, why are we not demanding that the public interest be served by establishing a meaningful criminal investigation into these organizations and their incentives? Further, why are we not agreeing, as a public, to no longer accept these organizations’ inputs into our pension, banking, and investment products? The answer is quite simple. Since our puritanically inspired inception as a nation, we have been taught to advance into the future with faith. Faith that a beneficent, vindictive omnipresence is watching out for us. Faith that the institutions that are established for our guardianship actually have our interest at heart. Faith that when we see overt evidence that a thing is not as promoted, it is our perspective that is wrong – that a wiser, higher being must understand a greater complexity than we can apprehend. Friedrich Nietzsche observed that all things are subject to interpretation and that the prevailing interpretation is based not on truth but on power. While observing a truism in humanity, Nietzsche seemed to avoid the extension of this observation into what I propose is Archimedean Theorem IV – humanity achieves no transformation or advancement so long as assumptions are unquestioned. The awakening of new possibilities and realities is only possible when we learn to courageously assert our intuition by freeing ourselves from the laziness of answers and dive deeply into the perpetual discipline of the unasked, unconsidered question. Haiti will then have pilgrims of conscience who will work to create social and economic systems which link people with purpose. Metrics of consumption will be replaced by metrics of replenishment and future productivity. Monetary authority will stand impotent against network exchanges where community benefits flow without capriciously imposed interest rates on Ponzi debt. Risk rating will be far less interesting than productivity and obsolescence accountability and transparency. Accountable stewardship will find quarter where faith has enjoyed unconsidered sanctuary. One week ago I was sitting on the sixth floor balcony in Providenciales , Turks and Caicos when waves mysteriously slowed in the bay to my north. Moments later, I felt the building shake and looked into the room to see my wife looking out at me. “Did you feel that?” Before I could respond, the earth moved again – this time with greater intention and for a bit longer duration. My mind raced across two oceans to last year when I was similarly confronted with a major quake – that time in the Kingdom of Tonga. Several seconds later, the earth calmed, the building stood silent and gradually, the waves regained their percussion. Armed with a fast internet connection, I went onto the United States Geological Survey website to see where the quake was. No information. So, I quickly filled out a “Did You Feel It” form and hit submit. When my browser confirmed the delivery of my report, I went back to the world map and there, in a bright red square, was the ominous news – 7.2. We all know that the movement of the earth in Haiti has moved the world. People are pouring out much needed compassion on those who have lost what little they had. 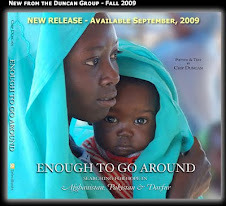 My dear friend and colleague, Chip Duncan – author of “Enough to go Around” and board member of Relief International – has been keeping many of us apprised of the devastation and human challenges confronting a part of humanity that has, for so long, been marginalized and forgotten. His encouragement, joining many others, is to do whatever you can to insure that much needed medical, food and shelter supplies are provided to attenuate the suffering that is so acute. I am moved, however, to write about the earthquake from an entirely different point of view. While a 7.2 magnitude earthquake is quite powerful – a 7.2 magnitude quake does not kill 100,000 people. At least it didn’t have to. The earthquake showed the weakness of our callous indifference towards resource distribution and poverty. What killed so many and injured countless more was the inadequate or inappropriate building materials and methods which put tons of unreinforced concrete and bricks above the heads of those who sought shelter. What killed so many was a global market where excessive supplies lead to over-built mansions built to unimaginable codes while a deforested island is left with meager supplies to make do. The earthquake illuminated, in tragic clarity, the cost humanity pays for immoral imbalances in resource distribution – an imbalance that no emergency charity can absolve. As some of my dear friends who do considerable work in Haiti pointed out a few nights ago, this year the same number of people would have or been disabled due to grinding poverty, violence, and inhumane living conditions. In a country where the life expectancy for most people is less than 5 decades and where only a few hundred miles away, we complain of economic crisis that means many of our population must return to work in their 6th and 7th decade of life, can we not see we need to WAKE UP. Last year, over 18 million children were displaced by war – many of them forced to engage in violence against their own people. Over 700,000 people were sold as slaves across international borders in 2009. Years after the earthquakes in the Indian Ocean, Pakistan, Iran, and India, thousands remain without adequate shelter. And consider this, 11 million earthquake and tropical storm survivable homes can be built for the same budget that the U.S. government spent on the C-130 aircraft that we use to shuttle relief onto landstrips after disasters. Sure, these arguments are often cited in terms of resource prioritization but, I’d like us to take a deeper look. Our real challenge in Haiti requires a deeper examination of a fundamental system failure. As a result, if we have any genuine intention of honoring those who lost their lives due to imposed inadequacy, we need to consider as much civil and economic engineering as we consider emergency relief. Haiti is a beautiful country which shares a beautiful island with its neighbor, the Dominican Republic. Separated by an arbitrary, colonial and slavery imposed boundary, these countries are worlds apart. We need to consider, in this moment of memory, that genuine honor of the human loss one week ago involves a commitment to building not only a different condition for the future of Haiti but making our actions generalizable in places like Colombia, Uganda, Cambodia, and Sudan. Well, start with the images from Port-au-Prince. You cannot help but see the piles of broken buildings and the rubble left in the aftermath of the quakes. But can you see the over 800 open source technology options that exist for immediate deployment in recycling this building material into aggregate for paving and tiling? Do you see the ability to do land and water reclamation and filtration using aggregate from this recycled material. Port-au-Prince is blessed with copious access to water. In a country where potable and irrigation water resources are scarce, which of the 12,447 low or no-combustion desalination technologies will be deployed for locally owned and empowered enterprises to create sustainable water and service utilities. Who will match these open source innovations – many of which are proprietary and restricted in the U.S. and Europe but were never patented or protected in Haiti – to local communities and entrepreneurs seeking to build enterprise, employment and engagement where the earthquake and poverty scarred the land and its people? There is coastal and for the development of bio-diesel and nutritional algae farms. There is degraded land for the deployment and testing of soil reclamation technologies. Rather than exporting aid, a new narrative would recognize that enabling local engagement will not only rebuild a city but will, for the first time in two centuries, ignite the innovation of a culturally rich people. Can we not only ship aid but commit to the support and creation of businesses that build renewable and resilient habitations with locally manufactured products; create medical outposts equipped with locally produced medicines and devices? Is that too much to ask? Is it easier to watch thousands die and then rush to aid those left in devastation? And speaking of people, for those who remain to deal with the aftermath, how do we as a global community immediately collaborate to use this moment to align our creativity with that which is local to imagine a Haiti not surviving but thriving? Long before the earth shook, our organization, in partnership with a few courageous civil servants at the World Bank’s infoDev program, deployed the Global Innovation Commons – a public resource for stimulating the use of open source technology to build ethical, commons-based market opportunities in the most marginalized countries on Earth. In our rush to show compassion, let us insure that we redouble our resolve to recognize that poverty and indifference created this catastrophe. And then let’s insure that every effort to “import” solutions is at least matched with an equal commitment to create local enterprise to engage Haiti (and countries in similar situations) in capacity enablement which can one day lead to safer houses, more engaged employment and industry, and a sense of collaborative participation in the global community. Let’s work to enable Haiti to join other Environmental Challenge Zones (like the volcanic region in East New Britain, Papua New Guinea) in being the experts in seismic technology and crisis response – building a new story out of the rubble of a scarcity laden past. So, entering 2010, allow me to challenge 2000 years of doctrinal construction and our modern economic conundrum…and then have dinner. By now, the numbers are in and we know that the U.S. government will default on both external (Treasury debt) and internal (fiscal recklessness) debt. Whether it is the U.S. debt ceiling paralysis in late February, a further weakening of buying criteria for unsecured credit purchases of Treasuries (now the primary buyer at auctions), or an external shock from China or the Gulf, we are blindly entering a maelstrom of a debt-financed economic stimulus without which we’d be on the edge of a technical Depression. We don’t have a plan for entitlements and we’re about to add to our illiquid safety net promise with a “bail-out” for the pharmaceutical and insurance companies (promoted under the moniker “health care reform”). And we’re ignoring the looming consequence of China’s one child policy. This year – 2010 is the year that the one child policy’s unintended consequence begins to emerge as the disproportionately large number of Chinese males enters adulthood. Over the next decade, between 50-100 million men will face the practical reality that the gender preference growing out of the 1979 population and poverty reduction policy means that they will never marry or procreate. The world has no modern analog for what’s about to unfold as 100 million people spend 100% of their earning potential AND their heritable wealth in a single generation. This consumption anomaly will not only require drastic economic policy shifts in China but will also invert the global supply chain for at least 20 years. In short, precisely at the time we need to have China be robust in its extension of debt capacity to the U.S., it’s own domestic priorities will dictate a massive internal focus where nationalism and consumption will be the most readily accessed means to placate a very unsatisfied male Chinese consumer. First, we must realize that our track record on forgiving debt has been abysmal. Oh, sure, we have addressed foreign debt crises in the past. However, our method for “forgiving debt” in the U.S. has been to destabilize governments, impose draconian measures on currencies, and extort gross imbalanced trade concessions from our “debtors”. How will these measures feel when the shoe is on our foot? 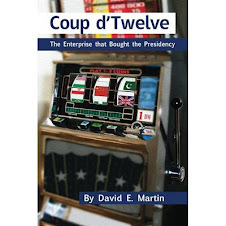 And remember, unlike the Latin American debt crises in the period between 1975 and 1982 during which countries used excessive debt to finance industrial output capacity and infrastructure, the U.S. debt has financed a war on terror and government subsidies – neither one of which can be repurposed to build GDP. 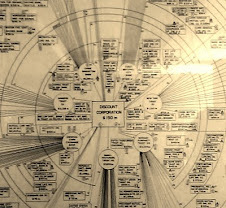 - From it’s birth in the 1950’s until the Reagan administration, venture capital (not called that at the time) relied exclusively on capital flowing into markets that were principally selling technology at premium prices to government buyers. Investor exits were in the form of merger and acquisition into defense, energy, electronics, telecommunications and specialty materials incumbent corporations – not public markets. It was government subsidies, not entrepreneurial risk, which created the venture miracle. And, it wasn’t until the late 1980 and early 90s that venture capital flowed into a majority of consumer-oriented enterprises. - The Small Business Administration wasn’t started as an economic development engine for the American economy – it was started as the Small War Plants program during the second world war to respond to the lethargy of the large military manufacturers’ inability to respond to German engineering and Japanese encryption. - Our two most productive decades of academic innovation in the U.S. were fueled in large part by foreign graduate students who came to the U.S. pre-9-11 and whose minds and bodies have returned to Korea, Taiwan, China, and India and are now continuing innovation that we took credit for while they were here. In short, we have a strong temptation to believe our own mythology and this does us no favors. Advocating a Green Innovation Venture Capital future to save us is foolish not just because it reinforces consumptive greed and restrictive, monopolistic excess. It fails its basic assumption of utility as it never worked in the first place. The VC funding efficiency for “green” technology underperformed conventional VC with enterprise failure rates exceeding 90% and technology adoption failure rates in excess of 95%. Solar photovoltaic global market dominance held by Sharp came not from the best innovation. Rather it came from Sharp’s capacity to benefit from Japanese credit subsidies that allowed technology infrastructure to be adopted with nominal cost. And China is taking its cues from Japan’s playbook and will do the same with LEDs, Organic Solar, and Hybrid Vehicles. Our temptation to rely on myth for our salvation is both empirically and morally bankrupt. Post Copenhagen, the only area that held a modicum of consensus was some vestigial notion of providing “funding” for green technology from economic powers to the economically marginalized countries. Missing from this discussion was the naming of the true beneficiaries of these proposals. UN-sponsored “Green Investment” programs as proposed, would benefit a new class of managing partners who would extract fees. It would benefit purveyors of false proprietary claims to extract licensing fees for fraudulently promoted research and development and intellectual property. And unfortunately, under most proposed frameworks, the use of the ecologically appropriate innovation Commons – those property rights that were granted but never deployed – are not even mentioned. In short, our temptation is to believe that we can enter the future promoting an enlightened agenda using the extractive, usurious, utilities of the past. This is neither possible nor appropriate. Central to a new narrative for humanity is the reclamation of understanding that it is in linking enterprise and incentive to integrated productivity that we can find our way. What I mean by this is quite simple. Enterprise begins by linking defined needs to a global, open review of all solutions advanced in any related field. After all, most innovation addressed only one of the multitude of contexts in which it could operate. Deployment friction inefficiency and public awareness failures – not true lack of solutions – keeps most entities unaware that their perceived “need” has been solved by someone else in another context. Enterprise may involve a conventional cash flow in which solutions are provided for financial consideration however they are not restricted to this monotonous view of values. If “need” exists where cash is not present or a viable means of compensation, alternative exchanges are part of the innovative proposition. Second, the preferred mode of enterprise involves the highest collaborative efficiency for the least extractive proposition. Process and mode innovation becomes as important as the innovation artifact. Third, metrics of performance and success are linked to the most ubiquitous delivery of goods or services to the most impacted populations at the lowest extractive or highest replenishable means. Monopoly-based scarcity models are explicitly rejected while Commons-enabled network value activation is rewarded. Finally, profit from industry is measured not in artificial time horizons (like quarterly reporting) but from all-in life-cycle reporting where the total social and financial gain from obsolescing, repurposed or recontextualized innovation is measured in the full consequence of system impact. For example, our proposal for St. Louis in which every new building adopts water recycling technologies is assessed not only for the reduced cost of water supply to buildings; the reduced cost of municipal water treatment and waste processing; the reduced cost of maintaining hub-and-spoke central processing capacity; but, it also measures the total financial inefficiencies required for financing conventional, centralized models in the form of bond origination, trading, and administration. Further, we measure the social transformation effect of having individuals – once disembodied consumers of taps and drains – see themselves as the mediators of value creation. We look at the field effect of this transformation on other innovation, entrepreneurial or consumer behavior. 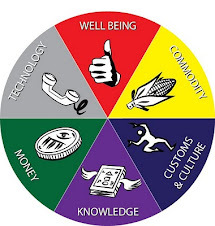 When we see that health, social well-being, and civil engagement all improve based on a simple innovation integration, we begin to see the consequence of the Commons dictum that everyone, at all times, must be conscious of their role as simultaneous producer/consumer/steward. “Too complicated”, you say? Absolutely not. When you consider the global cost of our thoughtless, anonymized-abuser ignorance-based system, you realize that we’ve simply followed the temptation of deferred morality. We won’t address our debt until it’s a crisis. We won’t address poverty until its shadow is on our doorstep. We won’t address wellness until we realize that our public health is at risk. 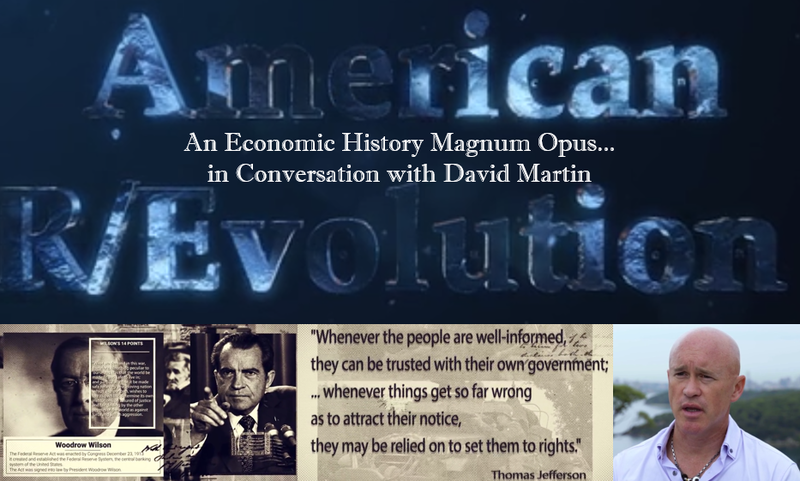 We won’t seek accountability in our financial markets until we’ve allowed exclusive classes of bankers, insurers and politicians to steal the public treasury in a fashion that would make despots around the world envious. And, it is this world – the world of progressive abusers – that we are transforming. An alternative is ripe for deployment – now. Welcome.